Tear off 4 large pieces of aluminum foil and place onto a cutting board. In the center of each piece of foil, evenly distribute the sliced zucchini, chopped red pepper and cilantro. Top with one chicken breast each. Season with salt and pepper to taste and squeeze the juice of half of a lime on each chicken breast. In a small saucepan, add the chicken broth and wine, bring to a boil. Remove from heat. Fold up ends of foil to create a pocket, seal ends tightly, leaving the top open. Carefully pour 1/4 of the stock into each foil pocket, and then seal the tops tightly. Fill a deep roasting pan with 1/2-inch of water. Place pockets in the pan. Cook in oven for 15-20 minutes. Meanwhile, cook rice according to package instructions. Once chicken is cooked, carefully open the pockets, as the steam will be very hot. 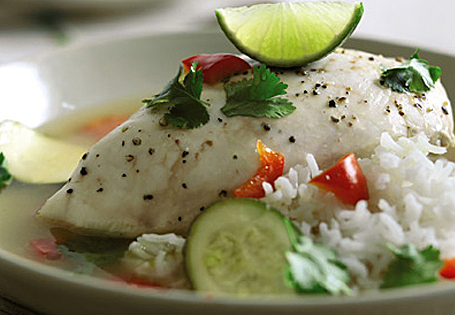 In a shallow bowl, add a serving of cooked rice, one chicken pocket, and drizzle olive oil to taste. Serve with lime wedges.